Before we begin with this week's Smark Henry RAW Review, I would like to offer two different wrestlers my deepest condolences. 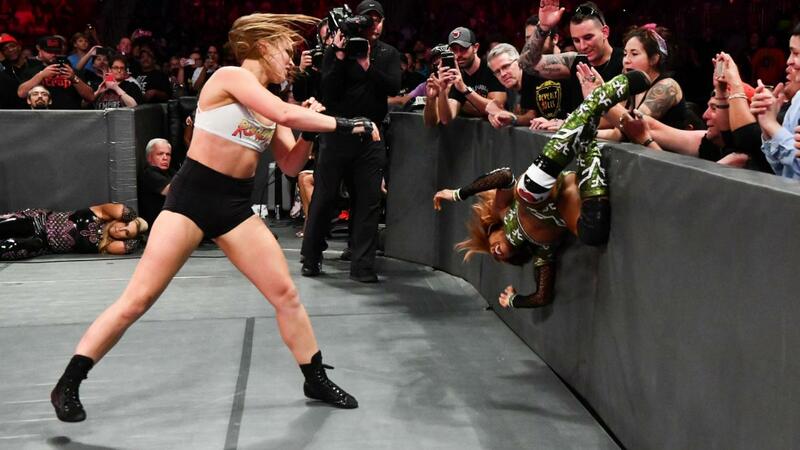 First, to Alicia Fox, for her massacre at the hands of "Rowdy" Ronda Rousey in this week's RAW main event. Second, to WWE RAW Women's Champion Alexa Bliss, for her title reign's possible massacre—also at the hands of Rousey at SummerSlam. You won't get to hear it, but while I was writing this piece, I gave them both a (perfect) ten-bell salute using my ceramic coffee mug that still had coffee in it and a plastic fork because I was too lazy to get a real spoon. RIP Fox. Your crazy ex antics will be missed. Now, onto the review. Mickie James is still injured this week, so Alexa Bliss wasted no time to quickly move on, kissing Fox's foxy behind as best as she could to get Alicia on her side. This plan would have been perfect if not for Natalya being in Rousey's corner. Rousey on her own is already a formidable force. With best bud Natalya watching her back? Bliss would need another woman just to even the odds. Bliss must really be desperate to go as far as calling Fox "a trailblazer and a pioneer of the women's division." I mean, Fox has been with the company for a while now, I have to admit, but, well, she's not exactly one of the people you think of when you hear the words "trailblazer" and "pioneer of the women's division." Stephanie McMahon has that market cornered. I had to check Wikipedia for that bit about Fox being a former champion, too, but that was mostly my fault for forgetting her 56-day reign in 2010. Bliss taking over for poor Charly Caruso and Fox sticking to her guns as an overconfident, delusional heel, even going as far as stating that she's better than Rousey, were the highlights of the in-ring promo for me. Bliss is really great at manipulating others to do her dirty work for her and it shows in this promo just seconds before the RAW debut of Fox's executioner. The match was more shenanigans than actual wrestling, but it was fine. Considering that this was Rousey's singles debut and Alicia Fox is, well, Alicia Fox, it wasn't that bad. Natalya and Bliss at ringside played their parts really well. The "ruthless babyface comeback after the cocky heel takes too much time prancing around schtick" was nothing new, but I have to admit, Rousey and Fox did a great job in their respective roles. Of course Fox was going going to waste time. That's her character. And Rousey getting pissed off and hulking out? Classic Rousey. What followed next was basically Fox's annihilation. I never knew I wanted to see Fox get destroyed this much until this match. In the immortal words of Ron Simmons (or is it word? ), "Damn." Rest in Bliss, Alexa. I'll be sending my prayers your way. ...but Natalya's turning on Rousey at SummerSlam, right? I mean, that smile and that hug... I'm going to bet my WWE RAW Women's Championship replica on that. Don't ask me why I have one. Something that you should be asking about, though, is where WWE Universal Champion Brock Lesnar was this week. Was he backstage reading a book and not watching RAW? Was he in Las Vegas, meeting with UFC officials? Or was he farming farm things in his farm? Considering that he already appeared on last week's show, I'm guessing we'll be seeing him next at SummerSlam. Man, his farm must be special. I wonder how Lesnar's corn tastes like. Unlike Lesnar, for obvious contractual reasons, Roman Reigns actually did his job tonight. The Big Dawg took on Stephanie McMahon's personally appointed Constable of RAW, BaRAWn Corbin. I'm not sorry for that lame pun. Finn Bálor's appearance late in the match, first to prevent Corbin from leaving the match and later to attack his beaten down nemesis, was bittersweet. On one hand, I was hoping that their feud had finally reached its end last week. But on the other? Bálor did lose last week's match cleanly. Seeing him Coup de Grâce Corbin for being a huge turd felt really satisfying. It's not like Bálor has anything better to do anyway, at least not for SummerSlam. Fingers crossed that the Demon King Bálor returns then. Speaking of Corbin being a huge turd, Reigns had a good argument against Corbin's actions last week, calling him a coward after the Constable elected to get out of Lesnar's ring. Corbin also had a good argument for his actions, though, referring to himself as having chosen the path of the bigger man. Personally? I thought Corbin did the right thing. Lesnar has manhandled everyone that he ever came face-to-face with, including Reigns. Why wouldn't Corbin get out of that ring to save himself? It was too late to save GM Kurt Angle, even if he wanted to, as Angle quickly ate an F5 before anyone else could react accordingly. There was no point in Corbin eating an F5 of his own. He wasn't the one facing Lesnar at SummerSlam. He wasn't the one who needed to save face for being an awful GM. He wasn't the one who needed to put Lesnar on a leash as part of his convoluted contract with WWE. Reigns was right about another thing, though: Him getting ejected out of the arena last week was a dumb move by Angle, even if it was an order from Stephanie McMahon herself. Steph continued micromanaging RAW through Corbin despite Angle's wishes this week as well, this time at Seth Rollins' expense. More on that later. Like last week, Reigns sucker-punched Corbin in response, though this was more of a punch to the gut really, which was in itself a pretty timely form of payback since Corbin did sucker punch Reigns earlier in the show. Wait, was that sucker punch payback for last week's sucker punch? Oh, my god! Is this sucker-punch-payback thing between Corbin and Reigns now a never-ending thing?! On a related note, Paul Heyman's pretty emotional sit-down interview with Renee Young was the best thing on this week's RAW. Heyman played up the tension between him and Lesnar, sadness and disappointment in his voice and face as he spouted his dismay at the (seemingly) end of their friendship. Renee, contributing a whole lot of subtle journalistic points in this segment, spoke for all of us when she asked if Heyman was looking for a new Heyman Guy—I recommend my best friend in the whole wide world Kevin Owens—but no dice. Heyman didn't give her an actual answer. He did give someone a warning, though, expressing zero confidence in Reigns beating Lesnar at SummerSlam by virtue of how focused and violent Lesnar has been the past few weeks. Damn right, Paul. I mean, Lesnar keeps manhandling Reigns every time they face off. With a more focused and more violent Lesnar, there's no chance in hell that Reigns will take that title home come SummerSlam. Subtlety. But before we forget that Reigns isn't the only one who could potentially be the new WWE Universal Champion at SummerSlam, my best friend in the whole wide world Kevin Owens and Jinder Mahal get plus points for continuity during the return of The Kevin Owens Show. Remember the last time these two guys were in a backstage segment together? Jinder was helping Owens find peace, teaching him breathing exercises so he could calm down. Unfortunately, Owens was too anxious to get on the same page. This week, they built up on that whole thing, with Owens revealing that he's finally found peace thanks to Jinder. I guess they continued those sessions off-cam. That's not really a surprise, considering Owens did come out to help Jinder win his match against Strowman last week. Technically. Sort of. I just have to say that every time Owens gets on the mic, I get chills. He's one of the best, if not THE best, talkers in the WWE right now. His segue from providing continuity with his previous interactions with both Jinder and Strowman to trying to get Jinder to back him up with his feud with Strowman was well-executed. KO in the Bank is an amazing nickname, too, which adds up to the Money in the Bank Briefcase feud by giving him a variation of Strowman's Monster in the Bank nickname. Man versus monster just won't cut it this time. KO versus Monster? Now that's something I'd like to see. Jinder's reaction to Owens egging him on to face Strowman tonight was understandable. He barely survived Strowman last week, even with his trusty companion, Sunil Singh, at ringside. There was no reason for Jinder to get hyped and confident, this week, especially since he's seen how Owens keeps running away from Strowman himself. Of course, because Strowman is a bully who will never be satisfied until he murders Owens on-camera, Mr. Monster in the Bank himself interrupted the segment by, well, being Braun Strowman and tipping over the custom-built stage of The Kevin Owens Show to send all three men plummeting to their doom. Classic murderous Strowman. The match in itself was as fun as a match featuring a ton of shenanigans could be. Owens trying to run with the briefcase again, Strowman learning from getting counted out last week, and Jinder getting his second consecutive win over Strowman despite it being a disqualification ruling when Braun hit him with the briefcase—all of these bits were pretty entertaining. I'll give this week's RAW a D for "Don't go into the light at SummerSlam, Alexa's title reign." The Revival finally got some in-ring action after all that Reigns/Lashley hullaballoo from a few weeks ago. Their non-title match against WWE RAW Tag Team Champions Curtis Axel and Bo Dallas, The B-Team, ended in a no-contest ruling, though, as the sore losers, a.k.a. The Deleters of Worlds, got involved. In Bray Wyatt fashion, the lights went out in the middle of the match and when they got back on, Woken Matt Hardy and his bestie attacked both teams because they can't stand watching from the sidelines. Talk about WWE divas. Why are you even bullying your baby brother, Bray? You've had your time with the titles! Let little Bo get a turn at them! That spot was pretty cool, though, I can't lie. Seth Rollins' attempt to take care of WWE Intercontinental Champion Dolph Ziggler and Drew McIntyre at the same time backfired when his second choice for a tag team partner, Roman Reigns, got banned from teaming with him by Stephanie McMahon herself because of something about protecting SummerSlam's main event, even though they should be worrying more about Brock Lesnar actually showing up at the PPV. What a heel. We all know Rollins' first choice for a tag team partner would've been good old Dean Ambrose but apparently he's still injured or whatever. Sure. Injured. Whatever. So in the end, Rollins had to take care of McInZigg all by himself. With the amount of talent in this match, it wasn't surprising how awesome it ended up being. Inevitably, Rollins lost but not without controversy. That's what you get for shrugging off Crossfit Breezeus, Rollins! This week's match on repeat is... The Riott Squad versus The Boss & Hug Connection. We're seriously calling them that? I mean, they don't even rhyme. Whatever. This was the same matchup from last week, though it ended in a different way, with Liv Morgan and Sarah Logan getting the win over BaySash after an interference from a returning Ruby Riott. Finally, their name makes sense again. All in all, this was, I think, better than their previous match. Kudos to everyone involved. I see that huracanrana, Bayley. I see that. Meanwhile, Elias and Bobby Lashley continued their feud through a pretty entertaining promo. I haven't seen Elias' documentary on the WWE Network so I can't comment on that. As always, Elias has complete control over the crowd, easily turning those cheers to boos when he needed to. Lashley, on the other hand, is Lashley. Him destroying Elias despite the momentary distraction was expected. Just look at him! Elias could've gotten great heat if he managed to put Lashley down for good, but that wouldn't have done Lashley any favors, especially since he was almost set to take on Lesnar for the top prize on RAW just a few weeks ago. Called it! Apollo Crews beat Akam last week, so naturally Rezar would beat Titus O'Neil this week. It's a little unsettling, though, because the logic in this booking undermines the whole feud. Wasn't the whole point of Crews' speech from a few weeks ago that Titus was a veteran who knows stuff and that the Authors of Pain could do well to respect and learn from him? Yet, here we are, a veteran wrestler who had a singles run getting pinned by someone who has been in a tag team through their whole NXT and WWE career. Odd. Bobby Roode beating Mojo Rawley was a surprise. I thought WWE had given up on him. The victory doesn't do him any favors, though. Unless he turns heel or does something that enhances his character, he will remain a great catchphrase with a pretty bland identity. So much potential wasted there.